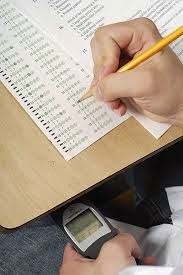 Anchor Collegiate: The Case Against Cheating: What We Can Learn From China. The Case Against Cheating: What We Can Learn From China. This grey area comes in the form of help from concerned, hovering parents. Parents who want to see their child succeed. Parents who feel it is their duty to help their student in the college application process. Parents who have the same motivation as the Chinese parents- admissions success. But in this case, Parents who unknowingly step over the line that divides honest help and cheating. A few months ago, at a gathering where I did not know many of the people, I was on the fringe of a conversation between two mothers. Both were discussing the admissions process as each had a student who had just navigated it. As I listened I heard one mother tell the other that she had been so frustrated with her son’s inability to produce a “quality” essay as he was “so very busy” that she took it upon herself to “help him along, because I knew what he was trying to say anyway.” (sic) The other mother was quick to tell her companion that she did the same, and even filled out a few applications for her son without his knowledge. Don’t get me wrong, I am all for a second, third, fourth, or even fifth set of eyes on a student’s college admissions essay. Part of my job is to comment on and correct student clients’ essays. I review at least 50 a year. Minor mistakes in spelling, grammar, and syntax are addressed. As an editor, I should comment on flow, writer’s voice, and clarity of message. I ask a lot of open ended questions: what are you trying to say here? What is your message in this paragraph? Do you think someone who doesn’t know you will get this, will understand who you are? Did you answer the prompt? I do not ever write essays. I do not rewrite essays. That is cheating. Don’t think that college admissions offices notice when an essay sounds like the writing of a 50 year old mom or dad, as opposed to a 17 year old student? Think again. So how do we know, as parents when we have crossed the line? When have we become facilitators in cheating rather than helpful parents? I pondered this for a few weeks and I have come with some questions. If you can answer YES to any of these, you may find yourself on that slippery slope. Have you edited a child’s paper and added words and sentences, or rewritten paragraphs? Have you ever filled out applications, scholarship forms, or inquiries without your child’s consent? Have you ever made a phone call to a school and insisted a grade be changed, without regard to the achievement or performance of your student? Would you be uncomfortable with a teacher or and admissions officer knowing how much and in what ways you helped your child? These small discrepancies may not seem like a big deal, but they are. They are because when it comes time to apply to college, students need to do it supported by their parents and counselorscollege admissions is not a group project. Parents and Counselors need to fill the roles of Gentle Reminder, Cheerleader, and Organizational Aide de Camp. When editing essays, ask questions like: what message did you mean to convey? Have you answered the prompt? Have you ended any sentence with a preposition? Have you used all the words correctly? What you don’t want to happen is for you to turn your child’s Honda into your own BMW. This current Chinese cheating scandal is just the tip of the iceberg. Recommendations there are forged, Grades are raised and a new “American” transcript is produced for Chinese students applying to college in the US. Essay ghost writers are hired; students are paid to memorize questions on the current SATs and report back to test preparation centers. They are still applying to and being accepted at some of the best schools in the U.S. And this current scandal will not keep them from cheating or from being admitted. Because it is imperative that we don’t roll down that slippery slope. Our kids deserve to know that they achieve admission at the college of their choice ON THEIR OWN. That their accomplishments, hard work, and dedication won them a spot at their school independent of their parents’ income, their tutor’s writing ability, or any other person’s contributions. Colleges are looking for students with grit and determination to succeed. They are looking to inspire hard-working, self-sufficient, students who know that they can triumph without a safety net . They are looking for your student: your bright, independent, stress-out-by applications-and-homework student. Know that your son or daughter’s Honda is fine. Know also that there is pride in personal accomplishment- accomplishment without cheating.